Art Labour Compendium a new Sophie Carapetian exhibition at the "xero, kline & coma gallery". New Sophie Carapetian exhibition at the xero, kline & coma gallery. “Art Labour Compendium” an exhibition by Sophie Carapetian has been visited by many people. 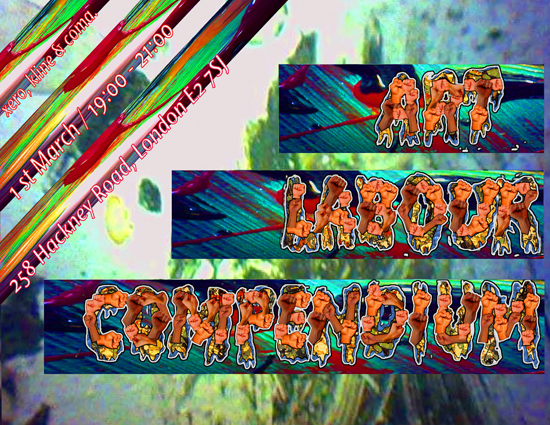 “Art Labour Compendium” was an on-going body of works that posed questions about the relation between art and the economy, triggering the capitalistic society and its nowadays more and more evident issues. The exhibition at the ‘xero, kline & coma gallery’ made considerations on labour and wage struggles within the arts economy, finding an interesting prospective that could be developed in future displays. The basic concept of “Art Labour and Compendium” is to be in a endless fluctuation form. Because is in a constant constitution, its present appearance is to bring together film, sculpture and photographic work. At the xero, kline & coma gallery the work of Sophie Carapetian gave new life to stories of the London branch of the Artists Union (1972-1983) and the Art strike action committees of London and San Francisco (1990 – 1993) by screening in the basement room film reel excerpts interviews with Stephen Perkins, Conrad Atkinsons, Stewart Home and Peter Dunn. On the street level room, instead, the was a huge photocopy of photograph ‘Hands’. “Art Labour and Compendium” also explored the problem of the vanguard displaying ‘Marx and Bakunin kissing’ a work on cardboard and paints. Sophie Carapetian focused on the reconciliation between Marx and Bakunin in the style of De Kooning, and explored the question of the labour bound up in the making of an artwork. The xero, kline & coma gallery is a project space run by young Pil and Galia, two teacher of Fine Art University of Reading. They are London based artists, writers and curators working in collaboration, whose work addresses the legacy of modernism, exploring promises and failures of the avant garde of the twentieth century. Their shows are related to the connection between art and politics. They are also the London editors of Art Papers.